Electric arc, and the arc flash created, are extremely dangerous and perhaps the least understood hazards of electricity. Arc flash occurs as a result of extreme discharges of voltage or electrical current from equipment, including switchgear, transformers and heavy electrical equipment. The arc generates a high level of energy for a very short span of time – up to one second. The intense heat can create temperatures as high as 19,000° C and can also produce electric shock, force and large quantities of thermal radiant energy. Putting it simply, arc flash is deadly. Arc flash clothes are critically important to keep workers safe. Statistics show that five to ten times a day, a worker in the United States is injured or killed due to an arc flash accident. The casualties resulting from these accidents are almost always devastating to the worker involved – and to the worker’s family. Perhaps if these workers had been wearing appropriately rated arc flash protective equipment, the number of injuries and deaths could have been decreased. Before I talk about workwear to aid safety while working in these types of situations, it would be irresponsible of me not to first talk through the hierarchy of controls. The hierarchy of control is a sequence of options which offer you a number of ways to approach the hazard control process. A list follows, with typical examples. When we look at protective workwear for electrical safety we are guided by ‘IEC 61482-2:2009 Performance & Design Requirements’; performance requirements for materials and design requirements for garments; plus marking and user information. This part of IEC 61482 is applicable to protective clothing used in work if there is an electric arc hazard. The standard specifies requirements and test methods applicable to materials and garments for protective clothing worn by electrical workers to protect them against the thermal hazards of electric arc based on relevant general properties of the textiles, tested with selected textile test methods. The ‘Open Arc’ test method is the same as the original North American method for measuring the Arc Thermal Performance Value (ATPV). Materials or assemblies are given an ATPV value, expressed in kilojoules per square metre (kJ/m2), which can be converted into the more familiar cal/cm2. The ‘Box Arc’ test method is based on the original European method described in ENV 50354, with a heat transfer measurement. Materials or assemblies are classified as Class 1 (4 kA) or Class 2 (7kA). During this test, a fabric sample is exposed to an electric arc produced by a 4kA or 7kA short circuit. In the test, the arc does not last any longer than 500ms. The amount of heat transmitted through the sample is measured during and after the test. On the basis of the resulting data and a STOLL curve, the length of time it would take to cause the onset of second degree burns is subsequently determined. Samples are also assessed for after-flaming, hole formation or melting. Industry experts in the UK, however, warn that the box test is neither realistic nor reliable4. A premise for this test is that the fault current will not exceed 4,000A or 7,000A, and that the worker will not be closer than the specified distance from the arc. In reality this cannot be guaranteed. The energy on the worker’s body is directly proportional to the length of the arc; for example, if a worker is positioned at 60cm from the arc, is exposed to 4cal/cm2 at 30cm from the arc, the energy will be approximately 16cal/cm2. Experience in the field has shown that hazards can range in strength starting from 3 or 4cal/cm2 to levels higher than 40cal/cm2. It can also be added that other restrictions of the box test include the assumption that the clearance time will not exceed 500ms, and the environment or eventual enclosure around the electric arc event are best stimulated by the plaster box. It is important to note that not only should the fabric be tested for conformance to the Arc Flash Standard, but also the complete garment or garment assembly itself. The garment test is not testing for energetic value but is testing to ensure that the garment structure remains intact after the arc exposure, and that components such as zippers and buttons are still functional and do not contribute further injury to the wearer by melting or heat transfer. Picking the right type of arc flash protective clothing is, fortunately, quite easy. Firstly, determine which category of risk a particular activity belongs to. Secondly, determine what type of clothing/equipment is required based on the category of risk determined. Thirdly, determine the ATPV rating needed. Once you have done all this, find the protective gear that meets or exceeds this rating. One thing to remember when picking the protective workwear is to try and ensure that no skin is exposed. Ensure that the trouser legs, if not connected to boots, go completely down to the boot. Also ensure that the sleeves of the protective workwear go down to the hand, leaving no part of the arm exposed. Lastly, remember that the head is the most vulnerable part of the body. Don’t forget to complete the arc flash protective clothing with suitable head gear of the same ATPV rating as the rest of the workwear, plus high voltage gloves. With arc protection, the environmental conditions and the risks at the working site must be taken into account. This is something we have touched on earlier with the box test. For example, a test under the standard using a 4kA test current (Class 1) subjects the garment/fabric to an incident energy of 135 kJ/m2 ± 56 kJ/m2 (3.2 ± 1.2 cal/cm2) over a 500ms exposure at 18-28° C, at 45-75% RH. If the working environment deviates from this temperature/humidity range the level of protection may be reduced. Exposure to higher incident energies or longer duration arcs may result in the garment providing insufficient protection. 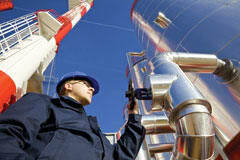 Risk assessments must therefore be conducted prior to live working. For full body protection, the protective clothing must be worn in the closed state and other suitable protective equipment, such as a helmet with a protective face screen, protective gloves and footwear/boots used too. No garments such as shirts, undergarments or underwear should be used which melt under arc exposures, e.g. those made of polyamide, polyester or acryl fibres. For maximum protection against arc flash exposure garments should be worn as part of a layering system; that is, in conjunction with a compliant shirt or other tested undergarments. The stark reality is that it’s not uncommon for an injured employee to never regain their past quality of life. Extended medical care is often required with huge associated financial costs. These costs are often passed back to the company, which may end up being involved in a legal pursuit from the victims and their families. A serious accident will undoubtedly also negatively affect workplace ethos and culture, and has been proven to reduce productivity through this lower morale. In addition to the human consequences – which are of course the most important consideration – a serious arc flash will damage or even completely destroy the affected equipment, leading to extensive downtime and expensive replacement and repair, and possibly causing the production line or even the entire plant to shut down for a period of time. The accident may also represent a failure on the part of the employer to comply with industry guidelines and regulations. This could result in a fine, litigation fees, increased insurance costs, expensive legal actions, and the imperative accident investigation –all of which are costly. NFPA 70E is the leading internationally recognised safety standard for arc flash prevention and protection. It covers shock hazard in a similar way to European standards, with subtle differences. In addition, it requires risk assessment for arc flash hazard, meaning that before work can be carried out near energised conductors this must be done. It is important, however, to remember that NFPA 70E does not protect personnel against the effects of arc blast. In Europe, the standards are published by the International Electrotechnical Commission (IEC). Arc flash hazard analysis on European power systems can be done using the IEEE 1584 standard, as recommended by NFPA 70E. Additionally, the UK shows compliance through the EAWR (Electricity at Work Regulations) 1989. Canada’s regulations on arc flash can be found in CSA Z462 and are addressed legislatively at both the provincial and federal levels. All provincial occupational health and safety acts have a general duty clause requiring employers to take reasonable precautions to ensure their employees’ health and safety. Throughout the rest of the world, either NFPA 70E or IEC 298 standards may be followed. So let’s recap. When all other control measures to reduce the risk of an arc flash have been investigated/implemented, protective clothing and PPE requirements should be considered. Protective clothing and PPE are required to limit workers’ exposure to incident energy should an arc flash occur. Incident energy causes burns – the major hazard to individuals from an arc flash. Appropriate protective clothing and PPE are also required during the tests to verify the absence of voltage after the circuits are de-energised and properly locked out-tagged out. When used, protective clothing and PPE should be worn as a last form of defence, but it should never be considered as providing an alternative to the other safety measures. The protection is not intended to prevent all injuries but to mitigate the impact of an arc flash upon the individual, should it occur. In many cases, the use of protective clothing and PPE has saved lives or prevented injury.